1. I'm thankful that it is time to turn the clocks back. An extra hour of sleep!!!! Looking forward to it! 2. I'm thankful for Ivy. I happened to mention that I was feeling some pain from plantar fasciitis, and the next thing I know, I received an email from Ivy, detailing exactly what to do to heal! 3. I'm thankful for Deedee. She inspired posts on Monday, Tuesday, Wednesday, and even Thursday. 4. I'm thankful for Drexel. On Friday, Deedee went to her other raiser for the weekend. Drexel happened to be outside when Deedee's ride arrived. (A mutual friend was headed to the other raiser's house and offered to take Deedee to her.) Deedee was gone when Drexel came inside. Drexel sniffed around by the front door, then turned around and gave me the most puzzled, accusing look! Are you aware of what just happened here?? Fortunately, my friend had not yet pulled away in her car, so I quickly took Drexel out to greet my friend and say goodbye. He was fine after that. 5. I'm thankful for the women I work closely with in my church calling--Melinda, Karlene, and Anny. They are so talented and inspire me to do better. I'm happy to count them as friends. 6. I'm thankful for another luncheon with other friends. I don't see these women very often outside of our occasional lunches, but always enjoy meeting together. Sometimes we share challenges or talk about deeper topics, but this time was mostly filled with laughter. 7. I'm thankful for razzleberry pie. Because it was my birthday this month, the organizer of the lunch asked me my favorite flavor of pie. I told her I liked about anything, but really loved raspberries. At the lunch, we had two pies--chocolate and apple. I took a half-piece of each, and enjoyed them. The next day, I got a message from my friend, who told me that the restaurant she had ordered the pies from had messed up the order, and that the apple pie should have been razzleberry. When she told them of their mistake, they gave her a razzleberry pie. She wanted to give it to me. (I offered to share, but she refused.) So, yum! 8. I'm thankful that I'm braver than a coyote. (John encouraged me to use that phrase.) This morning, I heard the "something's wrong" cry from my chickens, and sure, enough, when I went outside, I saw a coyote in my backyard. Fortunately, coyotes "shoo" fairly easily, and the chickens are fine. 9. I'm thankful for the fun of dressing up for Halloween, and for the creative ideas of others. Photo: My daughter-in-law and son dressed as frosted animal cookies. She is in pink, and he is in white, with big gumballs glued to their outfits. 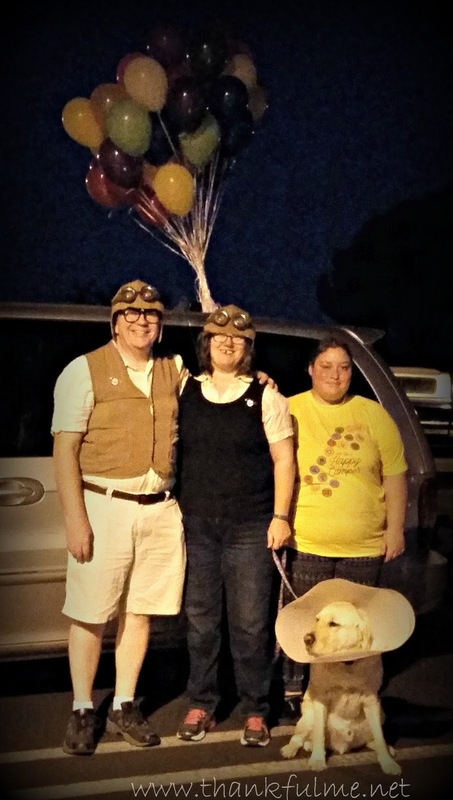 Photo: John and I dressed as the young Carl and Ellie from the movie UP, with our youngest daughter as Russell, and Drexel as Dug (wearing the cone of shame). We put balloons on top of our van for the Trunk-or-Treat at the church. 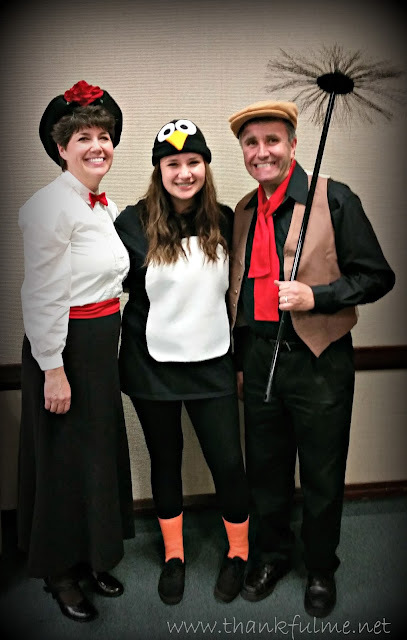 Photo: Our friends, dressed as Mary Poppins, a penguin, and a chimney sweep. 10. I'm thankful for John. He makes everyday a holiday! He was swarmed today by children wanting balloons. He is so patient and handled the mob well. Your turn! What are you thankful for this week? HAPPY BIRTHDAY! You have spent so much time on my personal healing I am happy I can finally be of some assistance! I loved UP... Dug was obviously one of my favorite all time characters! Thank you! Your advice has been spot-on! UP is one of my favorites, too! Webster's called and said they needed an illustration of the phrase: 'patient acceptance' and wanted to borrow the photo of Drexel. #4 dogs are perfect lifeforms! He is a trooper! It was funny how many times I had to explain to people that Drexel was in costume, and wasn't wearing the cone of shame for any other reason! How much Halloween fun! I, too love raspberries, you certainly could have shared some of that pie with me. I never heard it called razzleberry, though. Have a good week, coyote shoo-er. I'm hoping to not have to do any more shooing! Coyote sounds scary we had some sightings in NYC and Queens not far from Long Island and my sister was scared lol! I do think that trick-or-treating is for children, but I also think it is fun to dress up! If coyotes were prone to attack humans, I might have some fear, but they don't seem to want to have any interaction. They just hop the fence back to their field. I'm in Clark's camp...dogs are the perfect life form! Go Drexel. I've never been much of a fan when it comes to pie unless the pie happens to be raspberry! We don't get so many anymore as the Japanese Beetles seem to get them first. I didn't know Japanese beetles bothered them. I don't remember seeing any Japanese beetles when I lived where I could grow raspberries, and I can't seem to grow raspberries here where I do see Japanese beetles. The pie sounds wonderful..and what cute costumes. I am always costume challenged. Luckily, John is creative. He was responsible for the aviator hats. Your Up costumes are delightful! I skipped the dressing up part of the party & just handed out candy at the end. Poor Drexel! He gets a new friend, and she disappears! Glad he got it sorted out. I bet he'll miss Deedee this weekend, tail chewing and all. Love the Halloween costumes, especially the animal crackers! So funny! We'll see how long it takes him to figure out the routine. What a clever idea to give balloons to the kids! No left over candy to binge on later (speaking for myself). Your costume runs at Disney offers you a lot of costumes for Halloween. Good thinking! Braver than a coyote! I love this new title. If Drexel had been trick or treating here, he would have drowned in that cone of shame. It poured buckets here last night. A young cougar carried off a small dog from someone's porch in a small town near here recently. The owner looked out the window when he heard the commotion, and saw the cat carrying away his dog. I've never seen a cougar here, though apparently they are not unheard of. I don't know if I'm braver than a cougar. 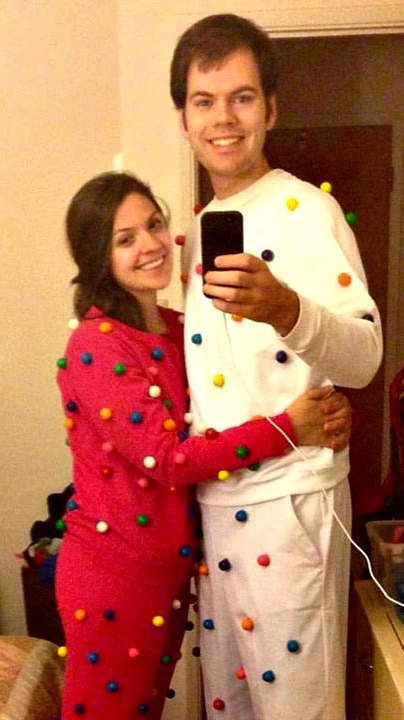 Love the giant gum ball idea. Wasn't that clever? My kids are way more creative than I am! I am thankful that Halloween and Movie Night are over! The PTA hosts a movie night each year (outside) and this year they showed The Nightmare Before Christmas the day before Halloween. It was wonderful but the week before is a ton of work and I am thankful it is over! Love all the costumes! Wow, that does sound like a lot of work--a lot of fun for the kids, but a lot of work! Totally missed your birthday, but still; all the best wishes for your next year in life, hopefully filled with love, health and happiness. Love your family outfit in UP-style. One of my favorites too.